Aspect ratio is the relationship between the image’s width and height. It’s best to choose an aspect ratio based on the context of the photo and how well the photo balances visually next to the surrounding chunks. 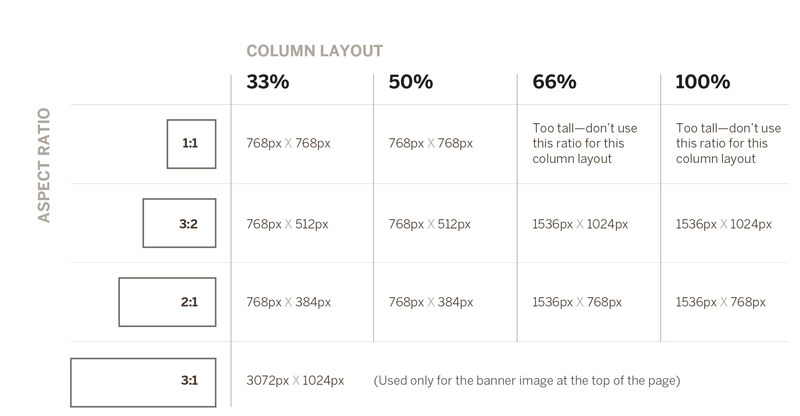 Use the following chart when sizing your images in Photoshop. Image resolution should be set to 72 dpi. We double the pixel dimensions of photos for optimal clarity on high-resolution monitors and devices. For more information on image placement and how to compress an image, visit the IU Web Style Guide. Jump to: “Placing a Single Image” instructions (in “Content Chunks” section). Jump to: “Create a Slideshow” instructions (in “Content Chunks” section).